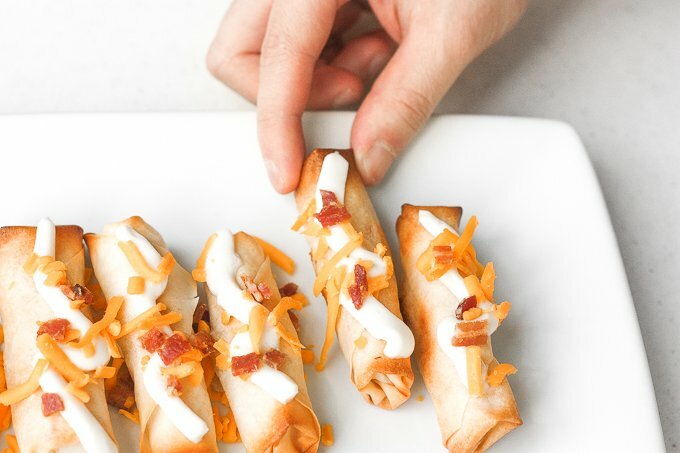 Baked mashed potato spring rolls. Yes you read that right. We are talking about the comforting flavours and textures of creamy mashed potatoes covered in a crisp crunchy layer of heaven. Somehow this combination works. It works really well. 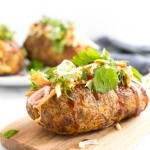 Potatoes are a key staple in every cuisine around the world. So, of course, they are the main ingredient in this Asian/American fusion dish. I first tried these amazing spring rolls at one of my favourite restaurants and I was inspired to recreate this favourite at home. But, naturally, I wanted a healthier alternative than the deep fried staple, so I baked them. I kid you not, this tastes as if it was fried. Brace yourselves people! Plus, because these are baked, you don’t have to slave away in the kitchen frying each one. You basically pop the spring rolls in the oven and let the oven do it’s magic. All you have to do is flip them over once. Talk about convenience! Speaking of convenience, all you need is a handful of ingredients, one pot, and one baking tray and you are basically halfway to creating this dish. Place spring roll diagonally (diamond shape) on a clear surface. Place 1 and 1/2 tablespoons of filling centered approximately 3/4 of the way down from the top. Fold up the bottom so it covers the filling. The bottom corner should approximately touch the centre of the wrapper. Bring in the two side corners to the center, folding over top. Roll the wrapper up tightly until 1 to 2-inches remains on top. Lightly brush the remaining corner on top with water and roll up to seal like a burrito. 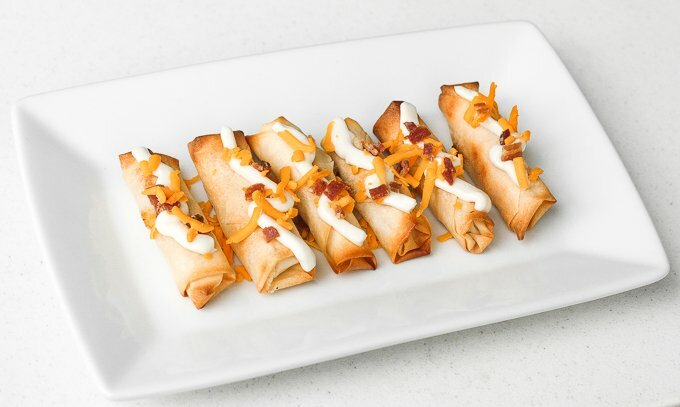 To store, place uncooked spring rolls on a baking tray lined with parchment paper and freeze for an hour. Then transfer spring rolls into ziploc bags or tupperware and use as desired. Baked mashed potato spring rolls combines the comforting flavours and textures of creamy mashed potatoes with a crisp crunchy layer of spring roll heaven. Place potatoes in a medium pot and cover with salted water to cover potatoes by about an inch. Heat over high heat and bring to a boil. 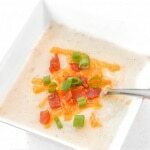 Reduce heat to low and simmer, covered for 15-20 minutes, or until potatoes soft when you insert a fork. Drain potatoes and place back in the pot. Using a potato masher (or a fork), mash the potatoes. Using an electric hand mixer, add in the butter and whisk until melted and incorporated into the potatoes. Slowly add in the cream and continue to whisk with the electric mixer. Add garlic powder, onion powder, salt and pepper.Remove from heat and allow to cool down completely. To assemble the rolls, take a spring roll and place it diagonally on a clear surface. Place approximately 1 and 1/2 tablespoons of filling centered approximately 3/4 of the way down from the top. Fold up the bottom so it covers the filling. The bottom corner should approximately touch the centre of the wrapper. Bring in the two side corners to the center and fold over top. Roll the wrapper up tightly until 2-inches remain on top. Lightly brush the remaining corner on top with water and roll up to seal like a burrito. 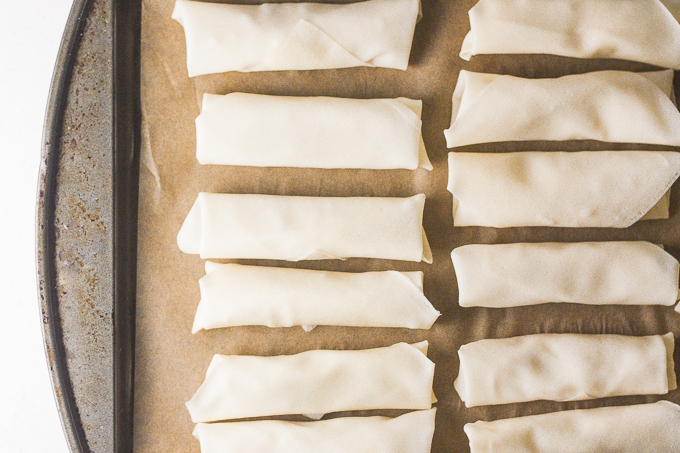 Place rolled spring rolls on a parchment lined baking tray and freeze for at least 30 minutes. Preheat oven to 425°F. Brush vegetable oil all over spring rolls. Place in oven and bake for 15 minutes. Turn spring rolls around and continue to bake for another 10 minutes until crisp and golden. 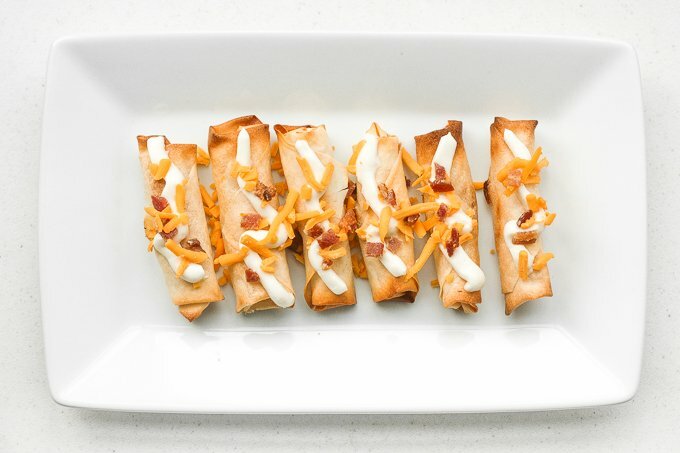 Remove from oven and top with sour cream, cheddar cheese, bacon bits and green onions. Serve warm! 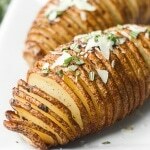 Find more easy to make recipes using potatoes at Potatoes USA or visit Potato Goodness on Facebook. They serve these as appetizers at Joeys in Bellevue Wa. I was looking for a copycat recipe; There are NO other recipes I could find other than this, and here they look IDENTICAL to the ones at Joeys!! 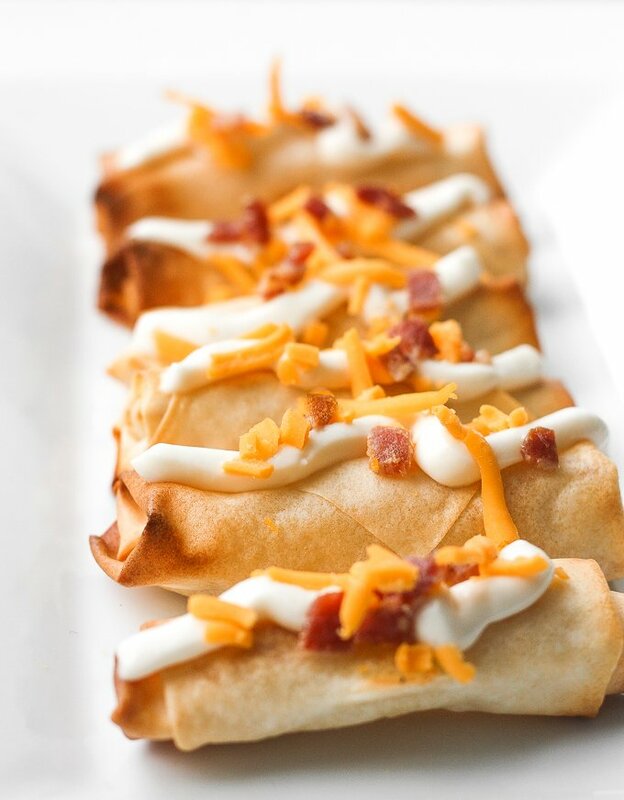 The crisp thin roll filled with a delicious creamy mash is a perfect combination. I can’t wait to get this dish done and try it out! That creamy, crunchy combo sounds just perfect! I love this idea and can totally see serving these at a party with some fun dipping sauce options! 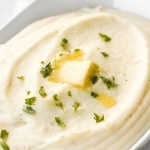 What a brilliant way to use mashed potatoes! These are just perfect for a party! Holy cow, these must be crazy good! definitely saving it for my next party. This is SO creative and fun! My daughter doesn’t like the texture of mashed potatoes but I wonder if she’d eat it like this?! I’ll have to try it out! 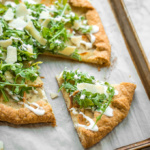 This is a total carb lover’s dream! This would be so fun for a party spread. And I love the crispy exterior with the soft mashed potato interior. YUM! I love the contrast between the crisp wrappers and the creamy potatoes! They sound fun, as well as tasty. I love the technique that you provide to fold spring rolls. This is not saved in my repertoire so thanks Sam. What an awesome way to serve mashed potatoes in individual portions. This would work so well as an appetizer around the holidays- but, honestly, I would eat it year-round! That sounds delicious, definitely gonna try this one!